The Bering Sea ( Russian: Бе́рингово мо́ре, tr. Béringovo móre) is a marginal sea of the Pacific Ocean. It comprises a deep water basin, which then rises through a narrow slope into the shallower water above the continental shelves. The Bering Sea ecosystem includes resources within the jurisdiction of the United States and Russia, as well as international waters in the middle of the sea (known as the "Donut Hole" ). The interaction between currents, sea ice, and weather makes for a vigorous and productive ecosystem. Most scientists believe that during the most recent ice age, sea level was low enough to allow humans to migrate east on foot from Asia to North America across what is now the Bering Strait. 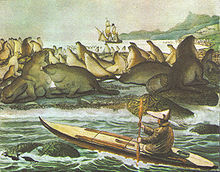 Other animals including megafauna migrated in both directions. This is commonly referred to as the " Bering land bridge" and is believed by most, though not all scientists, to be the first point of entry of humans into the Americas. On the North. The Southern limit of the Chuckchi Sea [ sic] [The Arctic Circle between Siberia and Alaska]. On the South. A line running from Kabuch Point ( 54°48′N 163°21′W﻿ / ﻿54.800°N 163.350°W﻿ / 54.800; -163.350) in the Alaskan Peninsula, through the Aleutian Islands to the South extremes of the Komandorski Islands and on to Cape Kamchatka in such a way that all the narrow waters between Alaska and Kamchatka are included in the Bering Sea. The Bering Sea shelf break is the dominant driver of primary productivity in the Bering Sea. This zone, where the shallower continental shelf drops off into the North Aleutians Basin is also known as the "Greenbelt". Nutrient upwelling from the cold waters of the Aleutian basin flowing up the slope and mixing with shallower waters of the shelf provide for constant production of phytoplankton. Some evidence suggests that great changes to the Bering Sea ecosystem have already occurred. Warm water conditions in the summer of 1997 resulted in a massive bloom of low energy coccolithophorid phytoplankton (Stockwell et al. 2001). A long record of carbon isotopes, which is reflective of primary production trends of the Bering Sea, exists from historical samples of bowhead whale baleen. Trends in carbon isotope ratios in whale baleen samples suggest that a 30–40% decline in average seasonal primary productivity has occurred over the last 50 years. The implication is that the carrying capacity of the Bering Sea is much lower now than it has been in the past. The Bering Sea supports many species of fish. Some species of fish support large and valuable commercial fisheries. Commercial fish species include 6 species[ citation needed] of Pacific salmon, Alaska pollock, Pacific cod, Pacific halibut, yellowfin sole, Pacific ocean perch and sablefish. 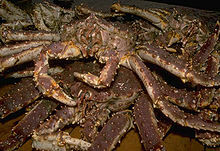 Shellfish include red king crab and Chionoecetes. ^ Springer, A. M.; McRoy, C. P.; Flint, M. V. (1996). "The Bering Sea Green Belt: Shelf-edge processes and ecosystem production". Fisheries Oceanography. 5 (3–4): 205. doi: 10.1111/j.1365-2419.1996.tb00118.x. ^ Schumacher, J. D.; Kinder, T. H.; Pashinski, D. J.; Charnell, R. L. (1979). "A Structural Front over the Continental Shelf of the Eastern Bering Sea". Journal of Physical Oceanography. 9 (1): 79. Bibcode: 1979JPO.....9...79S. doi: 10.1175/1520-0485(1979)009<0079:ASFOTC>2.0.CO;2. ^ a b Schell, D. M. (2000). "Declining carrying capacity in the Bering Sea: Isotopic evidence from whale baleen". Limnology and Oceanography. 45 (2): 459–462. Bibcode: 2000LimOc..45..459S. doi: 10.4319/lo.2000.45.2.0459. ^ Citta, John J.; Burns, John J.; Quakenbush, Lori T.; Vanek, Vicki; George, John C.; Small, Robert J.; Heide-Jørgensen, Mads Peter; Brower, Harry (12 June 2013). "Potential for bowhead whale entanglement in cod and crab pot gear in the Bering Sea". Marine Mammal Science. 30 (2): 445–459. doi: 10.1111/mms.12047.